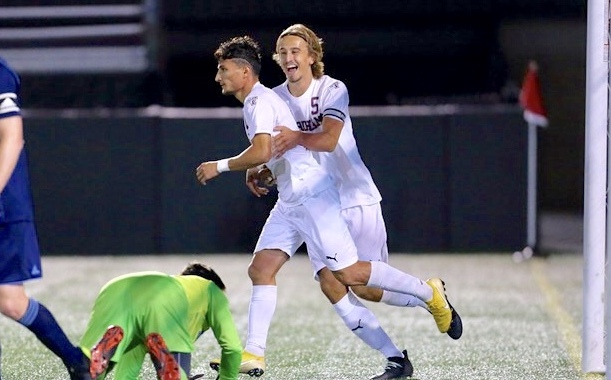 Sameer Fathazada scored one of Fordham’s two goals on Saturday evening in a 2-0 victory over A-10 rival Davidson (Courtesy of Fordham Athletics). 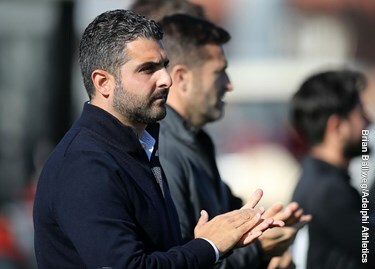 Three games remained in Atlantic 10 Men’s Soccer play coming into this past weekend. At the beginning of the season, most people figured Fordham would be solidifying its place at or near the top of conference standings by this point. Instead, the Rams have been riding a very precipitous road in conference play. Luckily for the Rams, a win on the road against Davidson righted the ship. 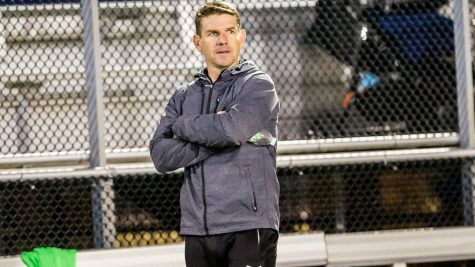 Fordham came into Alumni Stadium at Davidson Saturday evening with a conference record of 2-2-1, much to the chagrin of a team picked to finish first in the A-10 preseason men’s soccer vote. A road win against the Wildcats became imperative in Fordham’s pursuit of qualifying for the conference tournament starting Nov. 4. 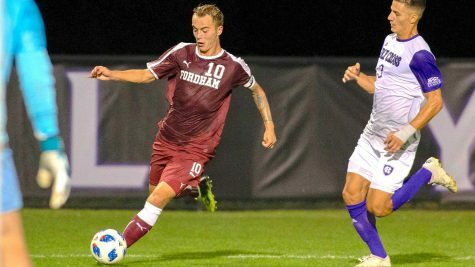 Boasting an 8-4-1 record, the Wildcats have been a pleasant surprise in the A-10 and proved to be stiff competition for Fordham’s finest. The first fifteen minutes of regulation saw Davidson control possession, putting Fordham on the defensive. Despite a slow start, the Rams slowly shifted momentum in their favor. Space began opening up, allowing Fordham to gain possession and build rhythm. This allowed players such as senior Janos Loebe, junior Johannes Pieles and sophomore Sameer Fathazada to operate. Scoreless at halftime, both squads were playing level, and even then the game looked primed for overtime. Fortunately, the Rams had other ideas. Fordham seized control of the second half. Making adjustments on defense, Davidson no longer saw lengthy possessions as had been the norm in the previous half. Now controlling the tempo, the Rams pushed forward and it finally paid off in the 60th minute. Loebe took advantage of a free kick from about 25 yards out, ripping a low shot towards the right post and past the Davidson goalkeeper for a goal. That moved Loebe into eighth on Fordham’s all-time goals scored list with his 24th of his career and, more importantly, it relieved pressure on an offense which had not netted a goal in its previous two games. No more than 10 minutes later, freshman Jack Sluys made a great run down the sideline and put a beautiful low cross into the box. 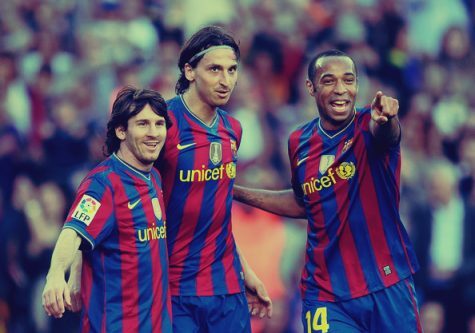 The ball seemed destined for Pieles, but at the last second, Pieles flicked it with his back heel to an open Fathazada who easily put it in the back of the net. In less than 10 minutes, Fordham made a huge statement on their way to a satisfying 2-0 victory, handing Davidson itsfirst conference loss this year. Fordham Men’s Soccer now stands at 7-3-4 on the year and 3-2-1 in A-10 play. Now fourth, the Rams have beaten two of the three teams ahead of them in conference standings this season. Atlantic 10, you have now been put on notice by the Rams of Rose Hill.